Is Tijuana getting tired of the narco corrido? This year’s drug-related violence along the border has brought another round of public attacks against “narco corridos,” those peppy accordion tunes about the exploits of drug traffickers. In an article today, The Los Angeles Times detects declining interest in “narco corridos,” perhaps as people view the songs as trivializing the bad behavior of thugs with drugs. In the case of some of these groups, as the story notes, art and life is also getting entangled in messy ways. I once interviewed Alberto Cervantes Nieto, the lead singer of Explosion Nortena, for a story on these groups. Nieto wrote songs about the region’s Arellano Felix drug cartel members. He used code names and references to events that the average person wouldn’t understand, and he told me he got his inspiration from newspaper articles about the cartel. A year later, he was detained by Mexican federal officers when he was found at a Tijuana seafood restaurant with suspected Arellano Felix members. I often wonder how and why people end up in the company of the cartel and I think the answers are as complex as human nature. The crazy thing is that I actually got hooked on Explosion Nortena’s songs – they kept on buzzing in my head for months after I wrote about the group. This is the infamous Tijuana mug shot. When authorities capture suspects here, the detainees are often paraded in front of news photographers. This typically involves a whole level of theatrics with the suspects being forced to stand before their stash of stolen goods or to wield the (presumably unloaded) weapons used to commit the crimes. Sometimes a weak smile emerges in the photos, but most of the time the suspects stare stone-like at the cameras in their awkward poses. Mexico City is known for its green Volkswagen beetle taxis that make the city streets look like they are sprinkled with green m&ms. In Tijuana, the city created an unusual system of multi-colored taxis that behaved like buses running around set routes. That’s how it was when I started working in Tijuana in 2000 until things started to change around 2003. The city’s traditional taxis were backed by powerful unions that the city was afraid to irritate because they had the capacity to shut down the city’s transportation system. So that’s just how things were until the metered New York-style “Taxi Libre” system finally caught on. 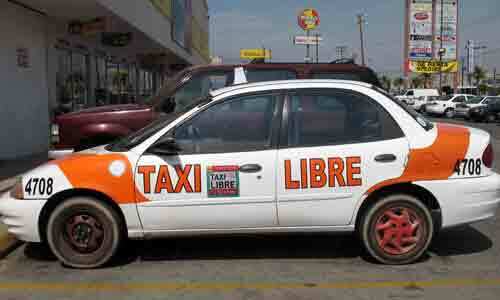 The “Taxi Libres” started out orange and white under Mexico’s National Action Party(PAN) government. But then the controversial mayoral candidate, Jorge Hank Rhon, won the city’s election in 2004. Hank, a gambling tycoon, took to painting the city in red, the color of his Institutional Revolutionary Party . Red showed up on walls, fences, and parts of City Hall. And soon the “Taxi Libres” were sporting red stripes instead of orange. Now that Hank is gone, and the PAN back in power, the red is being scrubbed off the city’s corners (replaced with PAN blue). Meanwhile, the cabs are being painted orange again in what appears to be an inconsequential but symbolic move to erase Hank’s influence from the city streets. 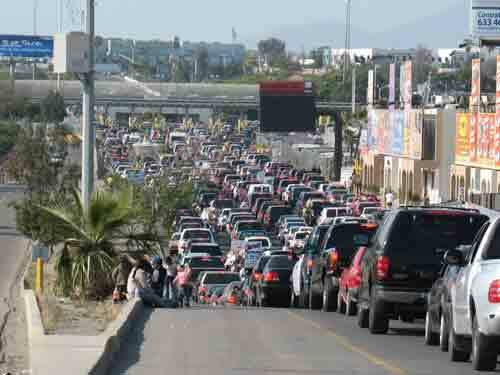 Growing numbers of cross-border travelers have been filling up their tanks in Tijuana before heading back north. With gasoline costing roughly $2.50 a gallon here, thanks to state subsidized prices, the demand has led to occasional shortages of gasoline in Tijuana. I hadn’t been affected by this – until Sunday. With my tank running dry, It took me five tries to find a PEMEX station in Tijuana that had gasoline. I guess I wouldn’t have been suprised if I had read this article in The San Diego Union-Tribune/SignOnSanDiego that warns about the worsening situation. 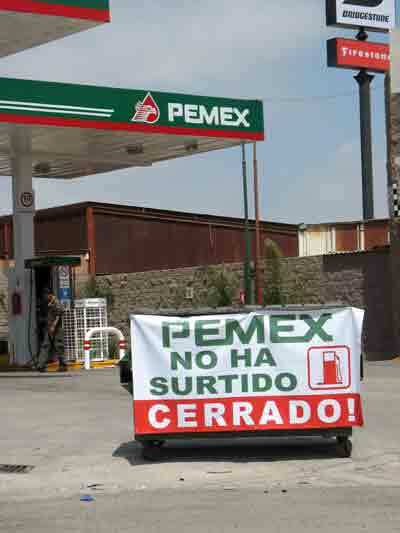 photo: No gasoline at this and other Tijuana gas stations this weekend. San Diego media report that this Sunday U.S. authorities are going to open up the cargo lanes along the Otay Mesa port of entry to northbound regular traffic from 5 p.m. to 8 p.m. It’s a one-day test that could be expanded to relieve border congestion along this part of the Tijuana border, according to The San Diego Union-Tribune and KPBS-San Diego. As Tijuana officials kicked off a bus tour to attract more tourists to the area, the New York Times reported that the city has become a draw for a different kind of visitor, the so-called death tourist. People seeking an end to terminal illnesses are finding an over-the-counter solution at Tijuana veterinary clinics that sell pentobarbitil, according to the story. The Los Angeles Times ran a story about a Kentucky woman who married a Mexican illegal immigrant who ended up being deported facing deportation. In order to stay together, the couple is living in Tijuana while she works north of the border and he takes care of the kids. The story is complemented with an audio slideshow. I’ve also added a news feed to this blog (see right column) so we’ll see how well that picks up these kinds of Tijuana-specific stories. photo: Regular weekend traffic at the Otay Mesa northbound border crossing lanes.